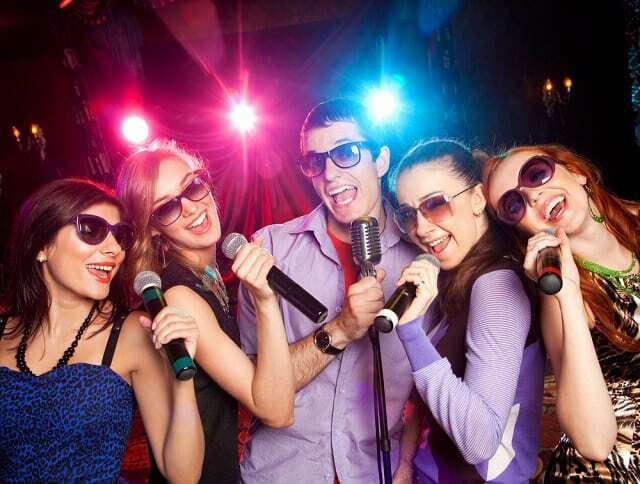 You’ve been singing in the shower but now you think you’re ready for the mike and you want to try out the stage… here are some tips to help make sure you have some Karaoke success and some FUN! 1. Go with a group: If you go with a few people you know, it will probably ease your nerves to see them perform. Plus, when you’re on stage, you’ll have a few people to look at if the crowd scares you. 2. Pick a song you know by heart: Your experience will go 1,000 times smoother if you go with a song you know all of the words to. If you don’t know all of the words, at least know almost all of them. The lyrics will be on a screen, but if you can focus on having a good time rather than the words, you’ll be fine. 3. Practice, practice, practice: Pick a song you’ve sang in the car (or your shower!) before so you know which songs you can actually sing decently. You may love Michael Jackson, but if you can’t hit any of his notes, avoid him at karaoke. 4. Don’t sing on an empty stomach: Just trust us. 5. Don’t perform while drunk: Especially if this is your first time, don’t be drunk. Nobody likes watching a drunken fool act like an idiot on stage, let alone being the drunken fool. 6. Breathe: You may be surprised at how easily you lose your breath. Even if you have sang the song a bunch of times in your car with no problem before, you have to account for the fact that you will be singing louder and your heart rate will be accelerated. 7. The bigger the crowd, the better: With smaller crowds, you may feel like everyone is watching; with bigger crowds, you can just look out at nothing. Also, bigger crowds get more into it. 8. Stage presence: You will be amazed at how much good stage presence can make up for a lack of vocal talent or knowledge of the lyrics. We suggest getting the crowd involved and pumped up. If they see you’re having a good time, they’ll want to embrace your performance, not trash it. 9. Lose yourself in the moment: Not to quote Eminem, but seriously just lose yourself on stage; become a different person for those three or four minutes. This is kind of a piggyback on No. 8, but if you perform and just forget about everything in life, it’s an adrenaline rush. 10. Remember that anyone who boos at a karaoke bar is a a real jerk: You are not on American Idol, you are a normal person out for a good time like everybody else. Most karaoke folk are good people and won’t be harsh if you can’t sing too well. If you don’t know the words, they’ll likely give you a hard time, but as we warned you in No. 2, you brought that upon yourself. Now go on out there and have some fun!